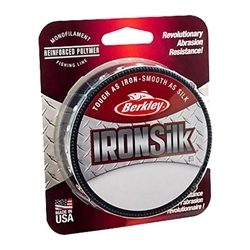 Berkley's IronSilk is Tough as Iron and Smooth as Silk!!! The only super-polymer mono fishing line that features a built-in molecular reinforcing network. This dramatically improves abrasion resistance, durability, and fighting power at a thinner diameter than other abrasion resistant lines. The Berkley IronSilk outlasts other "tough" lines 2 to 1 even over zebra mussels and oyster beds. It has an extremely smooth surface for long and smooth casts, as well as ultra-low memory that handles great on spinning and casting reels.